After spending an hour walking around the National Museum of Natural Science and exploring a little bit around Taichung, we worked up an enormous appetite. 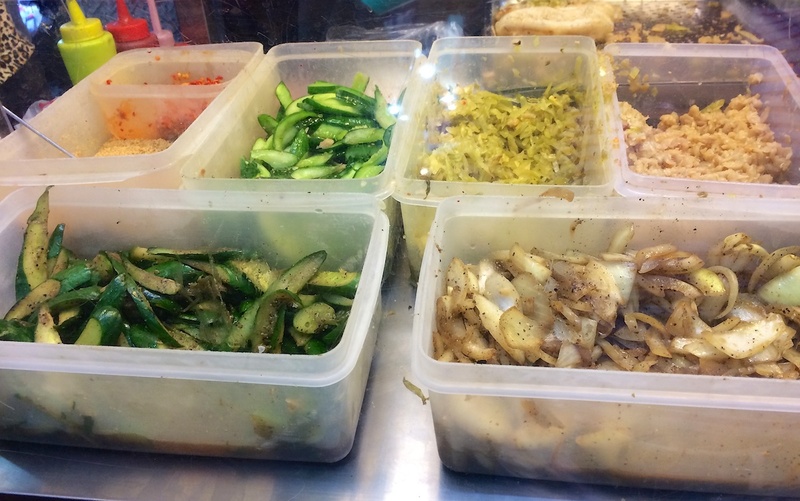 Equipped with loose clothing and a pocket full of Taiwanese dollars, we headed to the night market ready to satisfy our cravings. The market is surprisingly big and chalked full with food vendors! Where do I even start? 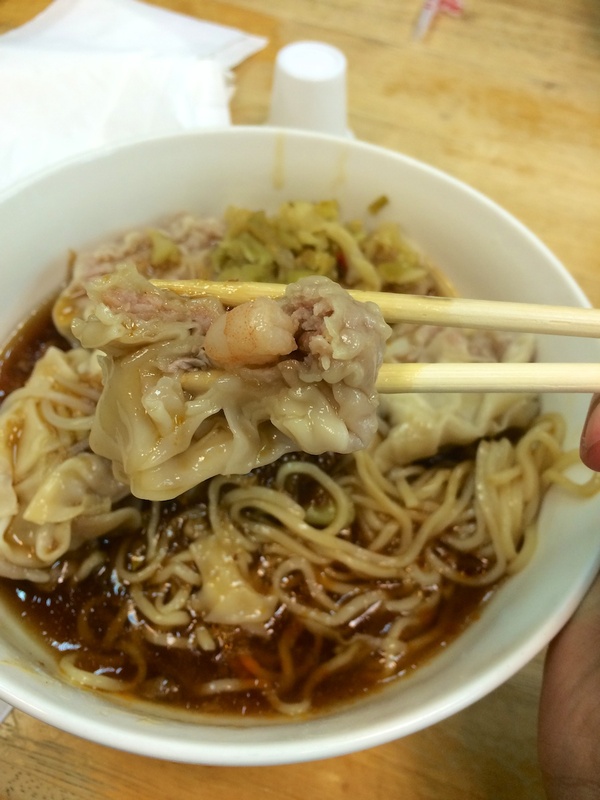 A friend, Jessie, who’s attending school in Taichung recommended our first course. 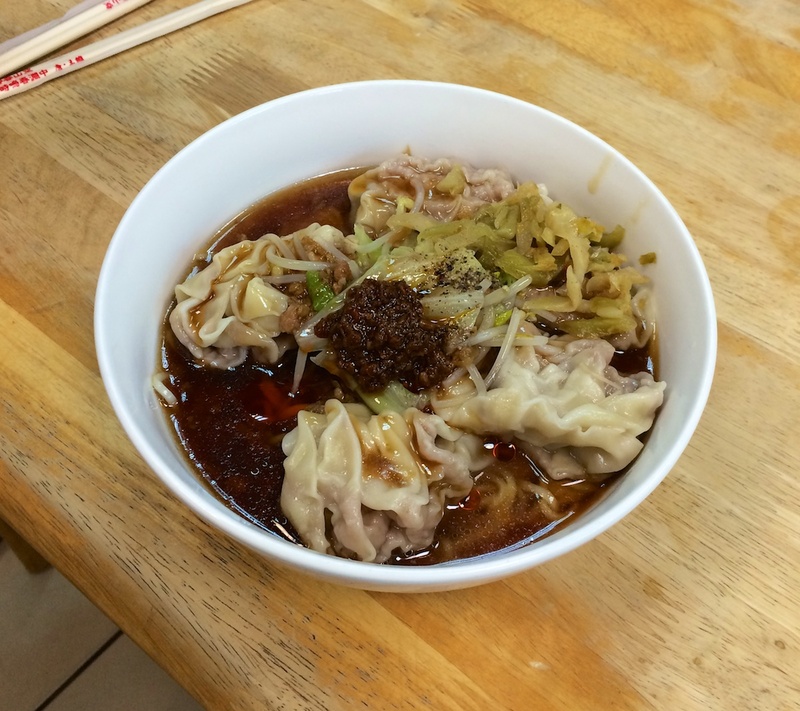 This is a spicy noodle dish with shrimp dumplings and my goodness, it’s delicious. 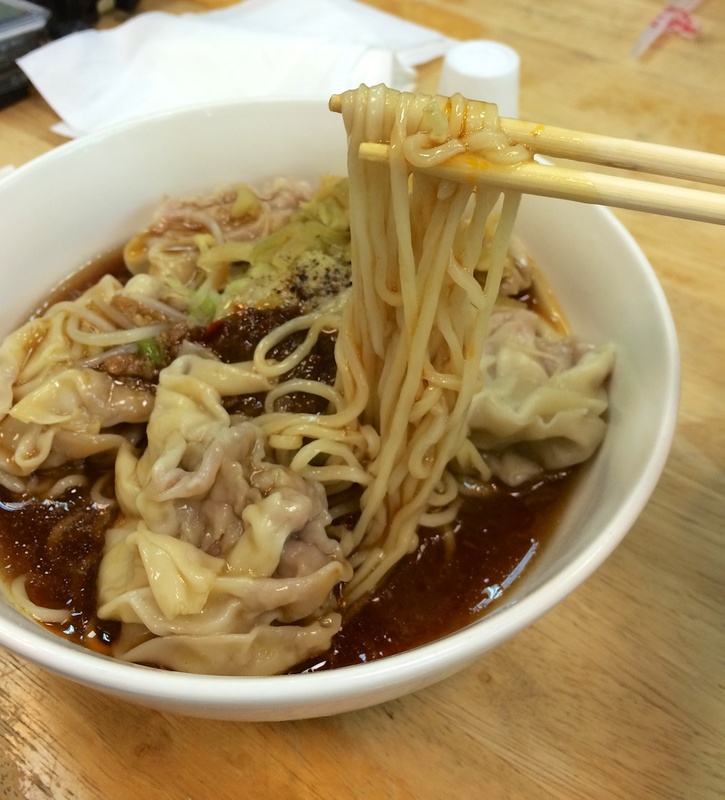 The noodles are al dente, the dumplings are juicy, and the broth is light. Note, the soup has a good kick from the spice, but the spiciness is not unbearable or numbing. 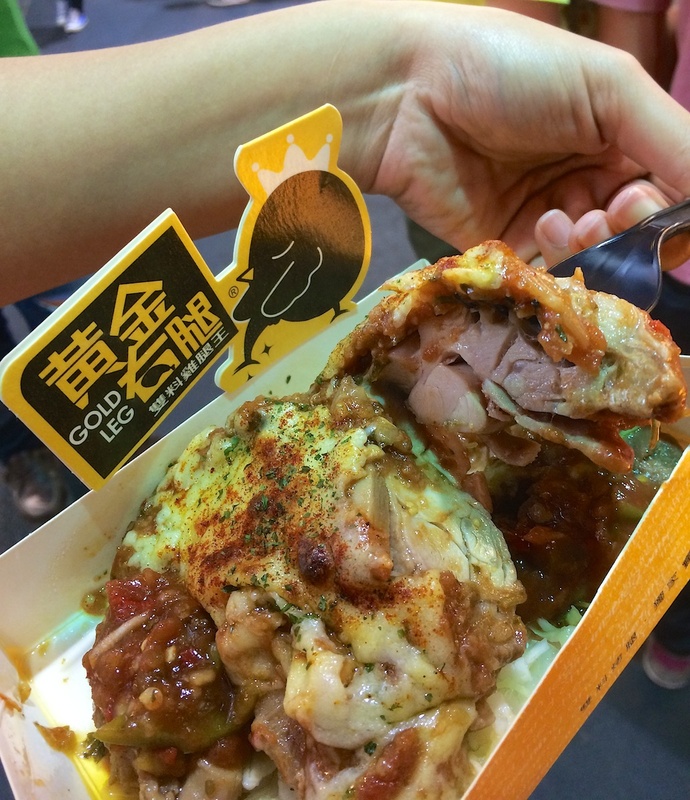 Second course: We were told by a cab driver to try the Gold Chicken vendor. 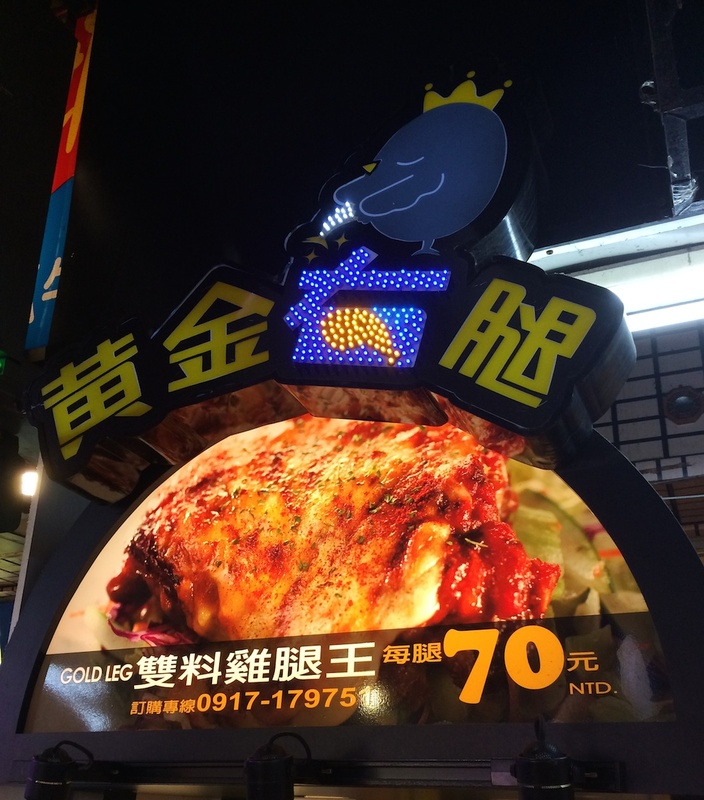 They are known for the 黃金右腿 “Gold Leg” chicken and the “Gold Left leg” chicken. Each leg is cooked in different style. We chose the Gold Leg chicken vendor. The chicken is lightly fried and finished in the oven topped with cheese and their special house made salsa. The chicken was good, but personally, I wouldn’t go back for seconds. 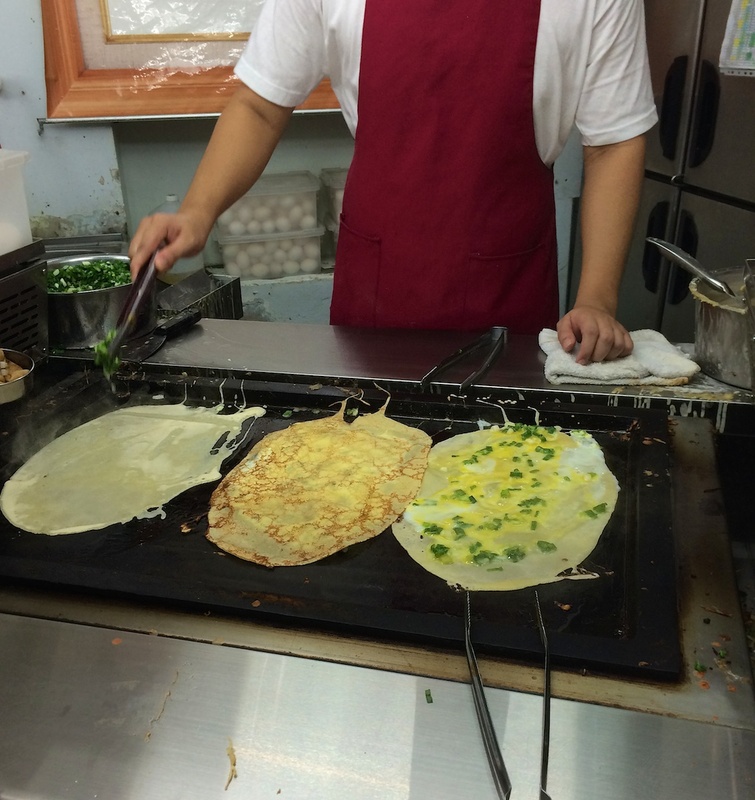 Third course: We walked around for a bit to digest the food we just inhaled and ran into this vendor with a sign that said, “MingLun Pancake: Less oil and salt, shallots, and a good egg.” Now who could turn down a sign like that? 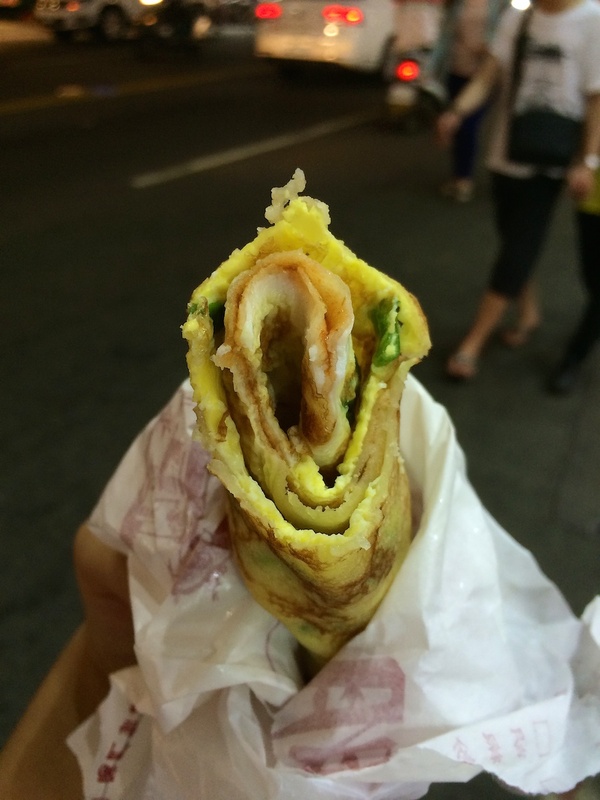 It’s a thin pancake — more like a crepe — topped with a “good” egg, green onions, and their special sauce all rolled up ready to be feasted on. It’s light, fluffy and with the right amount of seasoning. Fourth and final course: Had enough yet? 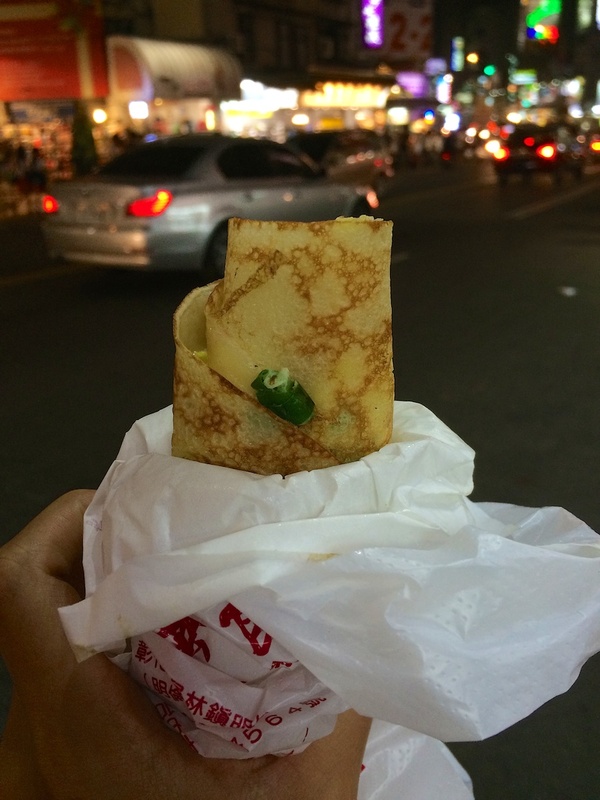 We were about to explode after enjoying the scrumptious pancake when we walked by the sausage stand. 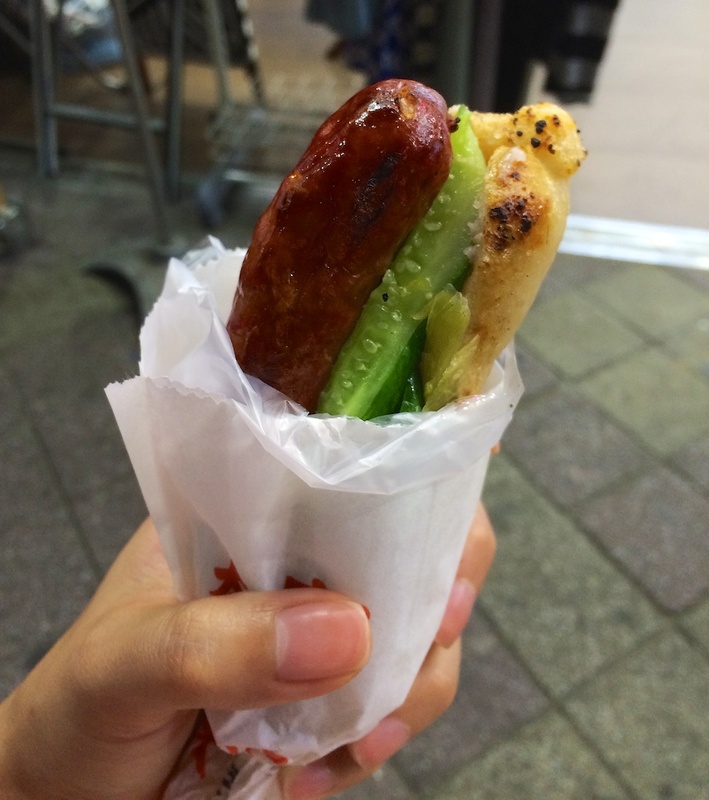 Although we were all full, we couldn’t turn down these glossy sausages — They were calling my name! 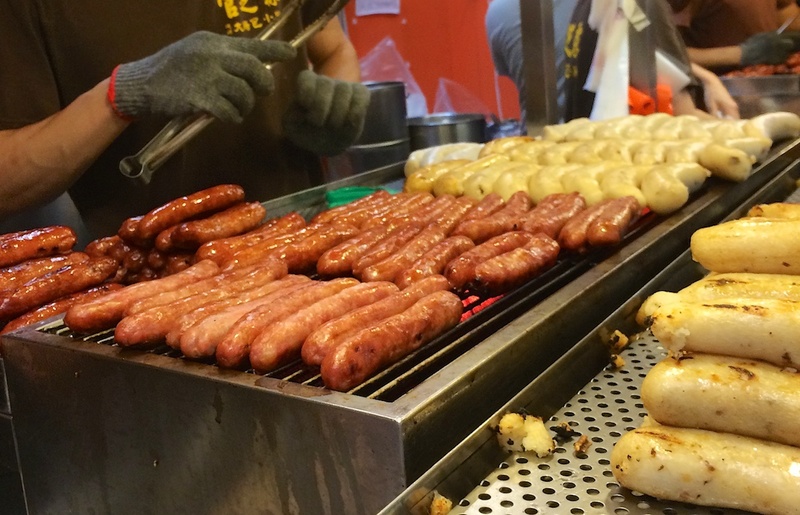 This street food is literally sausage on sausage. 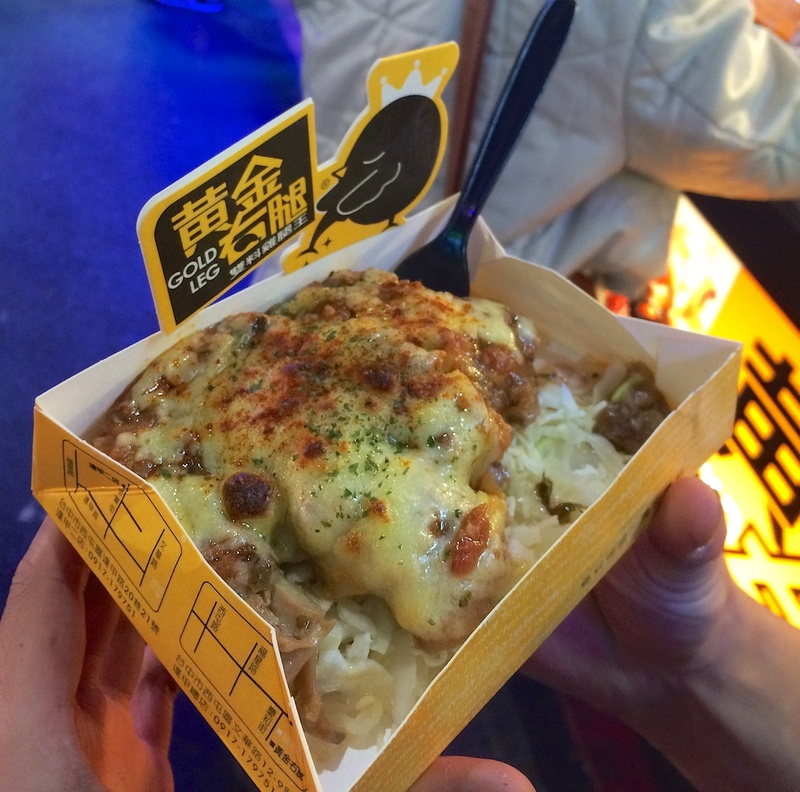 The savory meat sausage is nestled in a garlicky sticky rice sausage and it’s adorned with different toppings enhancing their flavor profile. It’s almost too offensively good looking to eat.